Distribution of all the archaeological sites in the Digital Archaeological Atlas of the Holy Land (DAAHL), which is part of the Qualcomm Institute’s new Center for Cyber-Archaeology and Sustainability. Archaeological sites in the Middle East are under threat of destruction not only from extremist groups such as Islamic State (ISIS), but also from the blade of the building contractor’s bulldozer. Now archaeologists in the United States are collaborating with the Israel Antiques Authority (IAA) to integrate a trove of IAA data about archaeological sites once controlled by Israel into the largest interactive Internet repository of data from ancient sites in the Holy Land. So far, the IAA has provided data from approximately 18,500 archaeological sites from the Survey of Israel database, and the information is now being added to the Digital Archaeological Atlas of the Holy Land (DAAHL). DAAHL is one of several ‘nodes’ that make up the Mediterranean Archaeology Network, or MedArchNet, led by UC San Diego anthropology professor Thomas Levy and Dr. Steven Savage, a research associate in the university’s Department of Anthropology. 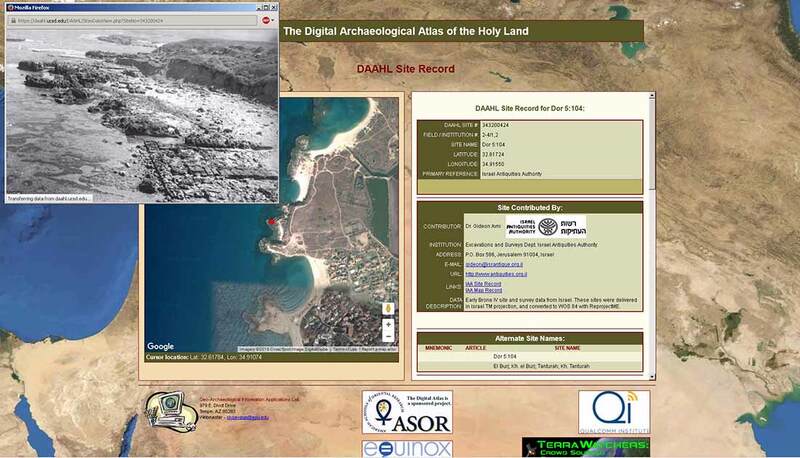 The coastal site of Tel Dor, showing the DAAHL entry and one of the images from the Israel Antiquities Authority database featured in the MedArchNet. The Survey of Israel data consists of detailed archaeological surveys overseen by the IAA since 1949, when Armistice Agreements were signed by Israel and neighboring countries Egypt, Jordan, Lebanon and Syria following the 1948 Arab-Israeli War. The agreements spelled out demarcation lines – known as Israel’s Green Line (or pre-1967 borders) – and the lines shifted after Israel captured territory in the 1967 Six-Day War. Nearly 30 years later, when Israel made peace with Egypt and signed the Camp David accords in 1978, the Israel Defense Forces (IDF) had to leave the Sinai Peninsula and relocate their bases in the Negev desert. At the time, the IAA (then called the Department of Antiquities of Israel) was charged with organizing massive archaeological surveys of those parts of the Negev where the re-deployment of the IDF was expected to have a long-term impact. The IAA also oversaw archaeological surveys in areas where the country’s rapid growth led to massive construction. For example, as Israel’s national road system expanded over the past 15 years, the IAA was called on to do most of the survey work. These and other projects have resulted in the discovery of thousands of new sites, each of which has been carefully recorded with numerous details about location, period of occupation, size, environment and more. Last December, a delegation from the Center for Cyber-Archaeology and Sustainability (CCAS), a partnership of Calit2’s Qualcomm Institute and the Division of Social Sciences at UC San Diego, visited Israel to meet with IAA officials. CCAS director Thomas Levy and Dr. Savage, a geospatial scientist and archaeologist with the center, met with professor Gideon Avni, head of the Archaeology Division of IAA. At the meeting, Avni, Levy and Savage agreed to work together on incorporating the archaeological survey data into the Mediterranean Archaeology Network – an online cyberinfrastructure of digital archaeological atlases with data nodes for the Holy Land, Greece and other ancient areas around the Mediterranean. By the end of 2015, the IAA had provided all its survey data from inside the Green Line, and administrators of MedArchNet’s DAAHL began integrating the data into the Holy Land repository. Working in collaboration with IAA GIS Specialist and Project Manager Liat Weinblum, DAAHL’s Savage is adding the Survey of Israel sites into the atlas’s already-extensive database of Levantine archaeological sites. The new site data includes basic site information, site donor data, lists of site components (periods and finds) for each site, and more than 17,000 photographs, site plans, and artifact drawings. The site information supplied by IAA will link researchers and students from DAAHL to the Survey of Israel web site, which provides academics and other users with more descriptive records for the sites and map sheets of the survey. The newly contributed IAA survey data will fill in current gaps in the DAAHL database for large regions of Israel. DAAHL will also enable enhanced search capabilities through the use of the node’s Spatial Search and Attribute Search features, providing much greater opportunities for researchers to conduct large-scale queries of archaeological sites in the Levant. The inclusion of the Israeli data will also enhance the information available to researchers about site preservation and planning activities. In addition to the data from 18,500 sites from the Survey of Israel surveys, the IAA has also agreed to provide quarterly updates as new map sheets are published and additional site information is released.